The days when Man walked the planet are long gone, and where there once were lush jungles and vibrant forests, only a desolate wasteland now lie as far as the eye can see, and the world is currently inhabited by robots. While some only care about their own well-being, there are those who still believe in the word of Man, the mighty creator. Enter Horatio, a robot with enough trouble as it is, his ship being badly in need of repairs and Crispin, his floating (and extremely sarcastic) sidekick, is not really helping. And as if their day wasn’t bad enough, an unknown foe decides to break in and steal their only source of power! 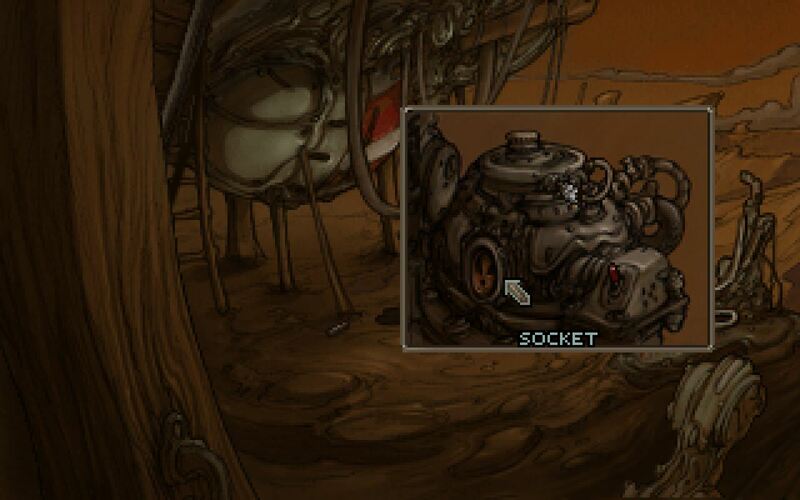 Since robots have a limited lifespan without a way to recharge, Horatio and Crispin are forced to leave the comfort of their ship and search for a replacement power source. Unfortunately for these two, things are not always what they seem in the wasteland.. 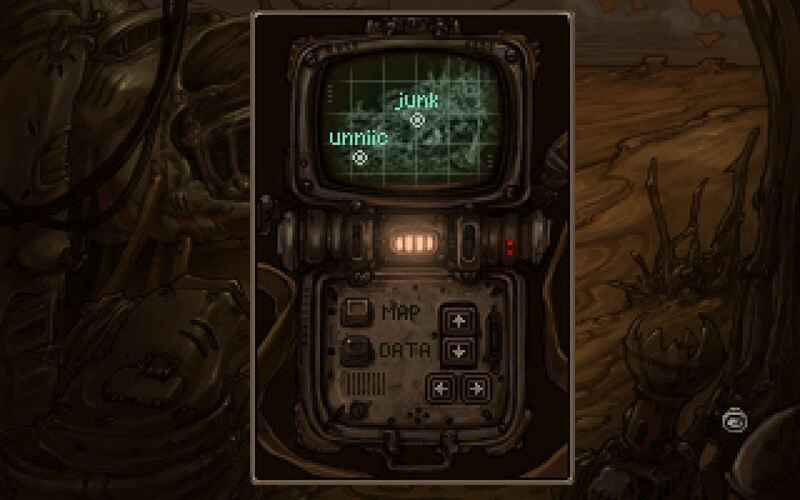 I recently got to play through a pre-release demo of Primordia, and if the overall quality carries over to the full release, Wormwood Studios have a point’n’click hit on their hands. For starters, it manages to avoid certain ‘typical’ problems that plagued many classic adventure titles, including illogical puzzles and too much backtracking. I’m not saying that every puzzle here is self-contained or that there’s no room for those eager to do some exploration, but even with a lot of different places to visit, the amount of time spent wandering around is kept to a minimum. This is possible due to a ‘fast travel’ system which lets you to jump between key locations after mapping their coordinates. Gotta love technology! While the world may be one big wasteland, there are still quite a few unique individuals to interact with during your travels in search of that power source. They may not all be friendly and some of them do seem just a tiny bit unstable, but considering the amount of sarcasm Crispin brings to each conversation, at the end of the day you’ll likely appreciate hearing a different song, whether it makes sense or not. There will be times when you need his help however, whether he likes it or not, as certain areas can only be reached by him and his little mag-lev unit. He won’t always do what you tell him, but don’t let that stop you from ordering him around whenever you feel like it – maybe it’ll even teach him to be less sarcastic (highly unlikely). Puzzles that involve a display/monitor or a panel would be quite frustrating if you had to locate and click on tiny hotspots, but fortunately that’s not the case here as you get a picture-in-picture close-up for those puzzles, instead of resorting to pixel-hunting. 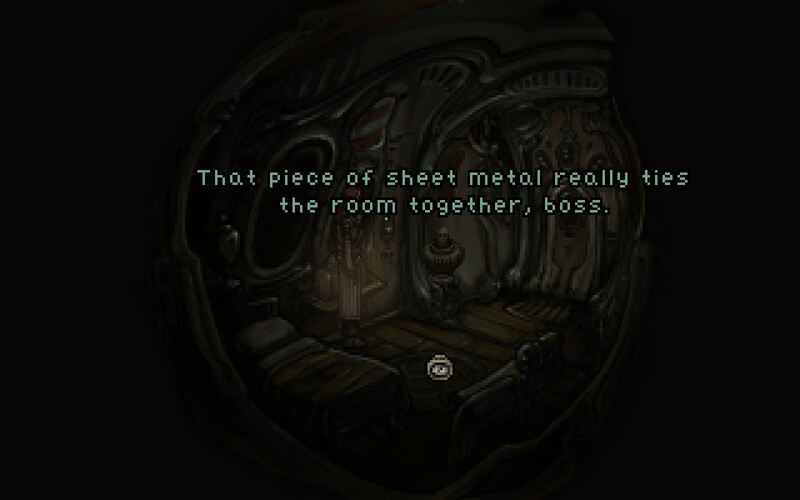 Oh, and speaking of pixels: Primordia‘s art style may not appeal to everyone, but in my opinion, the stylish hand-drawn visuals look quite good, with a somewhat pixellated look. On the audio side of things, the game features a fully voiced cast of equally high quality, including that of Logan Cunningham (Bastion and Resonance) as Horatio. Wormwood Studios may be the developer of Primordia, but Wadjet Eye Games will be the publisher, just like Da New Guys from Ice Box Games and Resonance from XII Games. Wadjet Eye Games are no strangers to developing hits themselves however, with titles like the Blackwell series and Gemini Rue. But this is about Primordia and those eager to experience Horatio and Crispin’s adventure won’t like this next bit: It will not be out until December 5, but I’m almost certain it will be worth the wait! In the meantime, I’d recommend checking out Crispin’s Log; if nothing else, it will prepare you for his ‘unique’ personality.